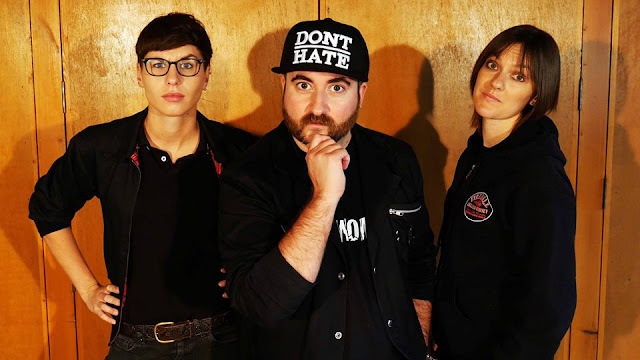 Brighton post punk trio Cockwomble (the band that feature Ramonas bassist Vicky Smith) will this month release their 2nd ep (their debut having featured here back in July : https://justsomepunksongs.blogspot.com/2018/07/cockwomble-henchmen.html). I played the title track, All Of The Money! None Of The Style! on a recent Just Some Punk Songs show and a combination of Stella Artois and trying to keep on top of the chatroom chat fogs my recollection a little but I remember it getting praised for the vocals. The song is about the entitled imbeciles currently running the UK. Track 2 (the one you'll find below) is about rampant consumerism, Henry XXXXXV (I think there's a video for this track due soon) is about our ridiculous inbred royal family and closing track Punk In A Dress is about how you don't need to dress in a certain way to be a punk. As you can tell, the band are opinionated, they also have a sense of humour and the happy knack of writing catchy tunes.